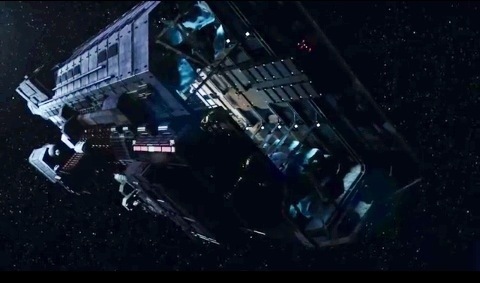 Set in the 23rd Century, The Expanse sets up humanity as scattered into three groups: Earth, Mars, and the colonists in the asteroid belt of our solar system. Earth and Mars have been at odds since the colonists of the red planet broke off and started their own militaristic society. In the middle of this are the colonists on the asteroid belt (or “Belters” as commonly called), the workers who mine the asteroids for materials both Earth and Mars require. “Belters” are very much the labor class of the solar system, decades of different gravity affecting them in different ways (remember Wall-E with the people on the spaceship? Think that, but instead becoming taller and thinner). 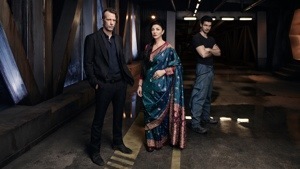 Into this several characters become big players in this season of episodes: a Belter detective, Miller (Thomas Jane); an officer on a ice breaking ship, Holden (Steven Strait); and Chrisjen (Shohreh Aghdashloo), playing a character that, slight spoilers, isn’t a player in the first book at all), a high ranking Earth official. Everything starts with the disappearance of the daughter of a big corporation, and Miller being tasked to find her. 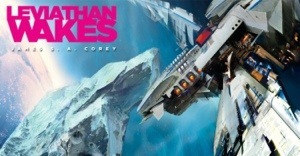 While Miller investigates the belt, the ship Holden’s assigned to, the Cantlebury, makes the surprising discovery of a derelict ship in deep space. What the Cantlebury discovers and Miller start to uncover is a massive conspiracy and a discovery that may change the future of mankind. 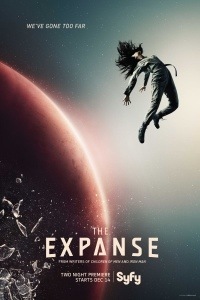 As a setup for The Expanse (in particular, this season is based on the first Expanse book, Leviathan Wakes), this first episode is a great setup for the big mystery of the show. It’s a universe that immediately reminds me of when Syfy still had Battlestar Galactica on the air, where space itself was a threat to the body and the mind. If you didn’t start going crazy, you had a good chance of losing a body part. And you get a good idea of what drives these characters, and how they live their lives differently on each of their prospective homes, planet and/or ship. And visually, the show owes a bit to Galactica, while setting up the own rules of its universe. Occasionally people have to wear magnetic boots to keep them from floating around, people need fluid pumped into them to survive high gravity force turns and acceleration, and the idea of air and water being more valuable than anything in these asteroid belt colonies are details that are rarely brought up in Sci-Fi TV, but here are second nature to everyone. And the environments are so lived in, you get a impression of what kind of societies these characters live in almost immediately. It’s a smart usage of production design and visual effects (note in one throwaway shot how 23rd century New York seems almost the same, but with some cosmetic changes all around) the show succeeds at. And casting wise, the performances are rock solid, with Jane as the world weary space noir detective Miller and Aghdashloo as a character who seems to dangle on the line of being a hero or a villain in her brief scene in this episode. And the supporting cast, namely the crew of the Cantlebury in this episode, “Dulcinea”, is rounded out nicely as circumstances turn a simple retrieval mission into something far beyond what they have dealt with. The visual effects are up there with the higher grade Syfy shows (even with one insanely obvious use of CG early on for hair in zero gravity). There is a long game being played here, as the episode ends on a nice cliffhanger, but not one that spoils or hints to the big conspiracy at the heart of The Expanse. It’s been a while since Syfy has dipped it into harder science-fiction, than just movies about Sharknadoes and reality shows about ghosts, and The Expanse gave me the goosebumps I used to have when watching shows like BSG or even the various Stargate series. Knowing what I know about the plot of the book, this is gonna be fun. The Expanse premieres on Syfy with the first two episodes airing December 14th and 15th, respectively, and future episodes will be on Tuesday nights.